On-demand workers have unprecedented access into the lives of their customers. We’ve all heard horror stories about crimes committed by unscrupulous service providers. These cautionary tales, which range from robbery to assault and murder, remind us it is urgent to thoroughly screen candidates and look for safe, dependable people. 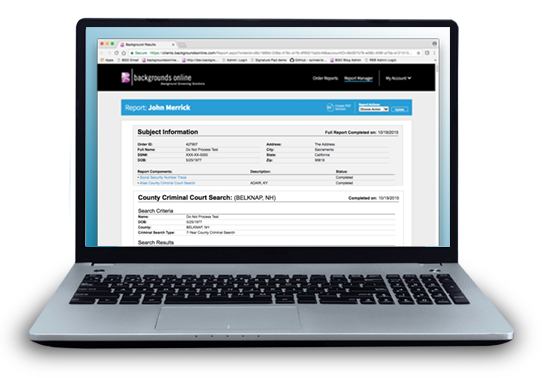 Backgrounds Online provides criminal searches that show you if a person has anything noteworthy on their record. We also offer drug screening services to help verify the people you work with are as reliable and trustworthy as possible. The on-demand industry offers a wide array of employment opportunities. Your contractors might give people rides, deliver products or perform an assortment of in-home services. Backgrounds Online provides a highly flexible screening platform. Our site makes it easy to build custom background check packages for any on-demand position you offer. Start with a basic screening package and add the reports you need, or build one from the ground up that you can save and use again for future hiring cycles. There are many opportunities for people seeking employment in the on-demand industry. That makes it crucial for your company to develop a quick and efficient hiring process. This includes background screening, which is an essential component. We make it easy to initiate background checks for your candidates. Our intuitive process and fast turnaround time encourages applicants to work with you instead of one of your many competitors. The on-demand industry is different than other business models, but it must adhere to FCRA and other regulations that apply to the background screening process. It is beneficial to create and document screening practices that will be followed for every candidate. Because laws that govern the industry are likely to change, it’s equally important to review those practices and update your documentation as necessary. Backgrounds Online has professional, FCRA certified screeners with advanced experience in developing compliant screening packages for all types of on-demand workers. If you need assistance when building your background check packages, contact us for expert assistance. Can you customize a screening package for my type of on-demand business? If you're looking for drivers, then include a Motor Vehicle Record Search. If you're hiring people who will deal directly with the public, then include a full array of criminal records searches. If you're hiring a position that requires a specific license, then include a Credential Verification. Our staff is highly trained and can help you put together the perfect screening solution. Please contact us if you have questions about screening for your on-demand business. Do you offer ongoing drug screening for on-demand contractors? A: Yes, we can schedule annual drug screening for your contractors. Our partner, Quest Diagnostics, provides 5, 10 and 14 panel screening options. To learn more, contact us. Will my business need background checks for every person we hire? A: Yes. To create an atmosphere of fairness and ensure all regulations are followed throughout your hiring process, it is important to run background checks for every person you might hire. When you partner with Backgrounds Online, you gain the ability to create specific background check packages that can be used for any type of employee. You can save those packages and re-use them every time you are hiring someone new. This makes your screening and hiring process faster and more efficient. How can Backgrounds Online help give me an edge over my competition? A: Competition is fierce in the on-demand industry. When you find dependable people you want to hire, it's important to move quickly. Backgrounds Online makes the essential screening process as fast as possible. Our Applicant Self-Submittal tool allows them to provide all their own information and start the screening process. This saves you time, speeds up the process and helps prevent common errors like misspelling an applicant's name. Once we have all the information and approval from your candidate, we start building a report immediately. We have a system in place to complete thorough reference and verifications services promptly, and a professional staff that is highly experienced at procuring all the necessary court records for your report. We'll prepare your background check in a timely manner so you can make final hiring decisions and gain an edge over your competition. Is your applicant submittal flow mobile friendly? A: Yes. Many job seekers prefer to complete the entire process online, including the background check. Our site and Applicant Self-Submittal features are mobile friendly so they can be used by anyone on any device. On-demand is a growing and exciting industry that is under a lot of scrutiny by the media and public. Make sure your business follows all federal and state regulations and avoids risk throughout your hiring process.